Sales of new single-family houses in November 2016 were at a seasonally adjusted annual rate of 592,000. This is 5.2 percent above the revised October rate of 563,000 and is 16.5 percent above the November 2015 estimate of 508,000. The median sales price of new houses sold in November 2016 was $305,400; the average sales price was $359,900. 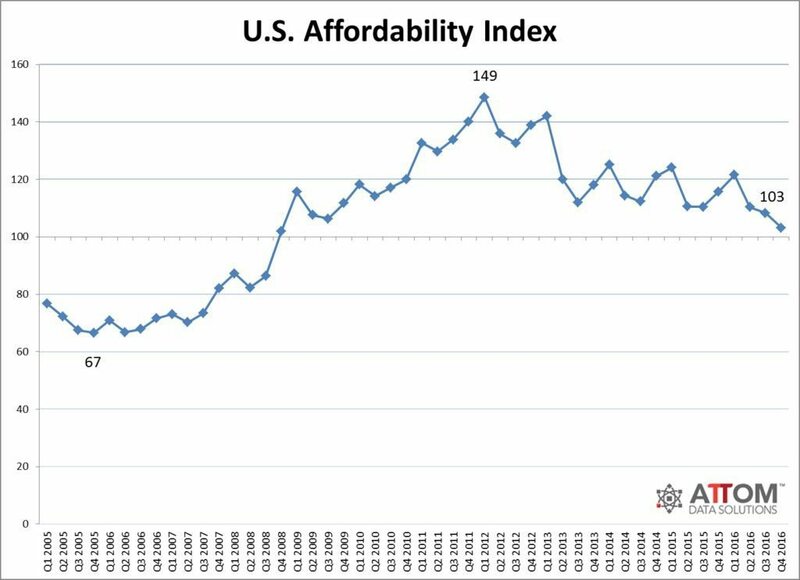 The national affordability index in Q4 was 103, the lowest level since Q4 2008. This is down from 108 in the previous quarter. It’s also down from 116 a year ago. U.S. house prices rose 0.4 percent on a seasonally adjusted basis from the previous month. The previously reported 0.6 percent increase in September remained unchanged. From October 2015 to October 2016, house prices were up 6.2 percent. 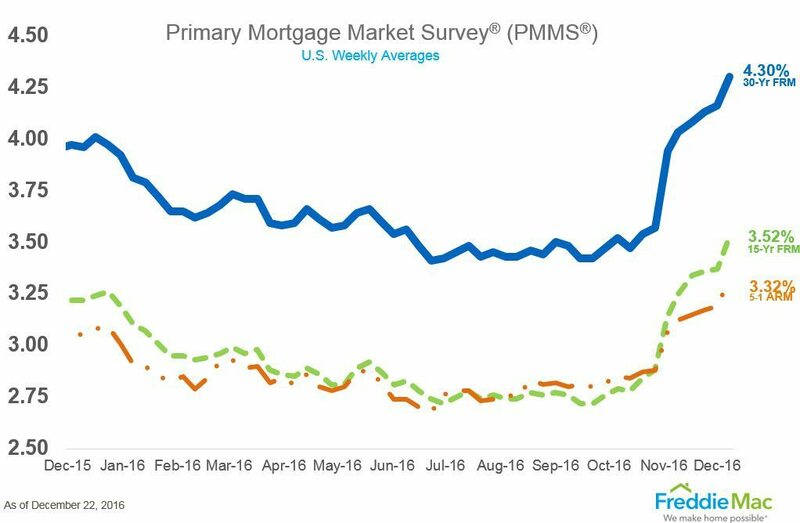 The 30-year fixed-rate mortgage (FRM) averaged 4.30 percent with an average 0.5 point for the week ending December 22, 2016. This is up from last week when it averaged 4.16 percent. A year ago at this time, the 30-year FRM averaged 3.96 percent. Non-distressed properties sold during November had an average price of $299,900, based on a three-month moving average. That was up 0.9 percent from October 2016. Prices in November were up by 5.8 percent percent compared with the average price for non-distressed properties sold in November 2015. The median home value in the U.S. is now $192,500. Home values rose 6.5 percent over the past year. Rents rose 1.5 percent over the past year to $1,403 per month. The serious delinquency rate for mortgages owned or guaranteed by Fannie Mae and Freddie Mac (the “Enterprises”) fell to 1.16 percent at the end of the third quarter of this year. Overall, the Enterprises completed 46,390 foreclosure prevention actions in the third quarter. The number of 60+ days delinquent loans declined 3 percent to 421,765 at the end of the third quarter. The delinquency rate was up by 2.55 percent month-over-month. However, the rate was down 9.43 percent year-over-year. The number of loans in active foreclosure dropped below 500,000 for the first time in nearly 10 years.